After summers of skipping around in the mountains, I’ve moved on to a new kind of life: the intern life. One of the pluses, besides air conditioning and killer resume building projects, is eating on the capitol square. I get to walk around in my business casual shoes and pretend I’m part of the working world. So I walk in step with the other business casuals on the square in search of the perfect cart. 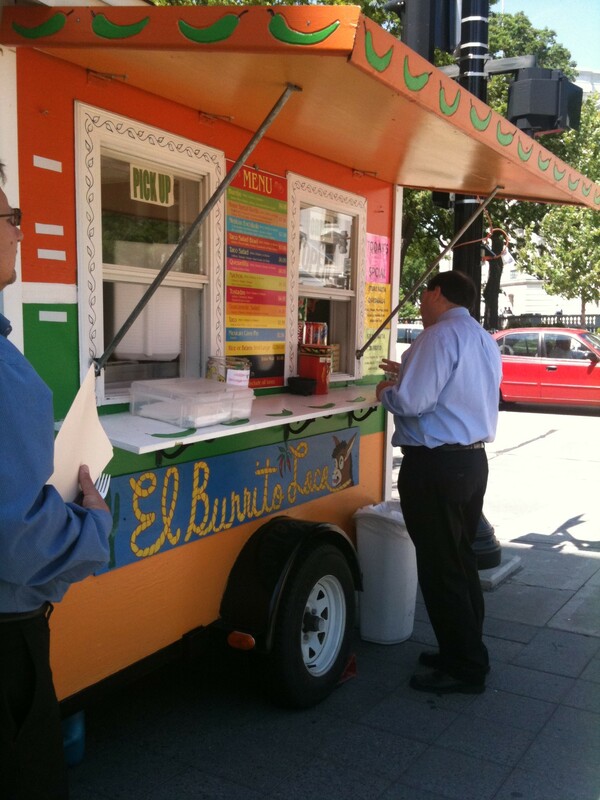 I’m absolutely always in the mood for Mexican, and El Burrito Loco was in sight. There were at least ten lunchers waiting for their food so I hoped crowded also meant delicious. Confused at first, as to where I should order, I stepped up to the plate (or window as it were) and ordered the chicken burrito with mild sauce. The menu had all the essentials: burritos (chicken, beef, veg), tacos, nachos, enchiladas and the meal of the day was steak fajitas – All for fairly reasonable prices ranging from $2 per taco, $6 for burritos and $7 for the fajitas. After the order, I grabbed my fork (no napkins left) and waited. and waited some more. After about 10 minutes of small talk with my lunch companions they called out my CHICKEN BURRITO MILD SAUCE and we headed for the capitol lawn. The waiting bothered my companions more than me but that could be because I spent the last four months in Nepal where ‘fast food’ isn’t in anyone’s vocabulary. In any case, forewarning: if you’ve only got a half hour lunch, or you’re truly on the run, this isn’t the cart for you – especially at peak lunch hour during the week. Chicken, rice, sour cream, lettuce, cheese, tomatoes, pinto beans, and mild sauce. In my extensive burrito endeavors, this is a fairly standard array of ingredients so it’s less about what’s in it and more about how exactly it tastes. It tasted fine. Burrito like. Chicken-y and saucy. Really saucy. It wasn’t spit-it-out-it’s-awful and it wasn’t blow-my-mind-order-4-more either. I was pleasantly indifferent to my meal. Also, it didn’t stay a burrito for very long. Everything was damp enough (or saucy enough?) 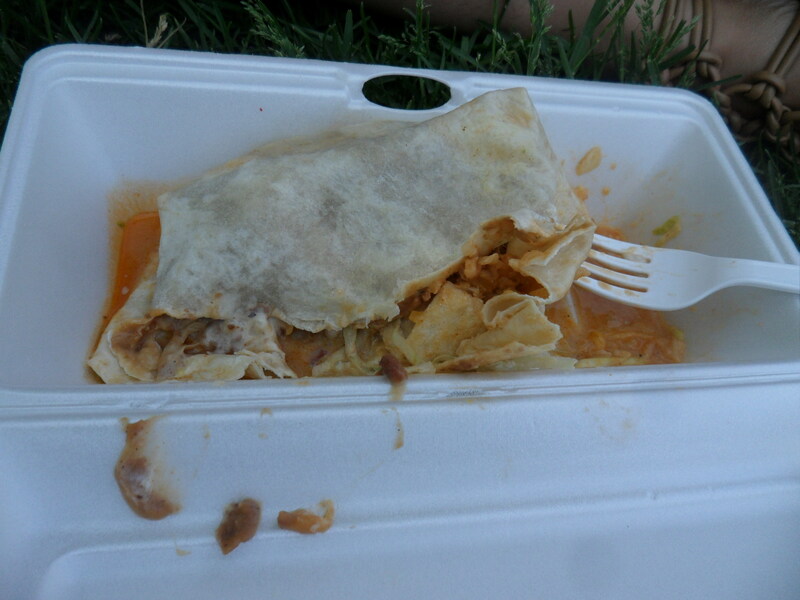 that it leaked pretty heavily and split the burrito almost immediately upon grab. The fork came in handy, and it was pretty messy to eat (especially because I didn’t have napkins). Not delicious and not bad. Not the place for quick eats or bold flavor but hey, I haven’t given up on El Burrito Loco – I’m still willing to give their other food a chance (and maybe try the ‘hot’ sauce) but for now, less on the loco burrito and onto another cart!